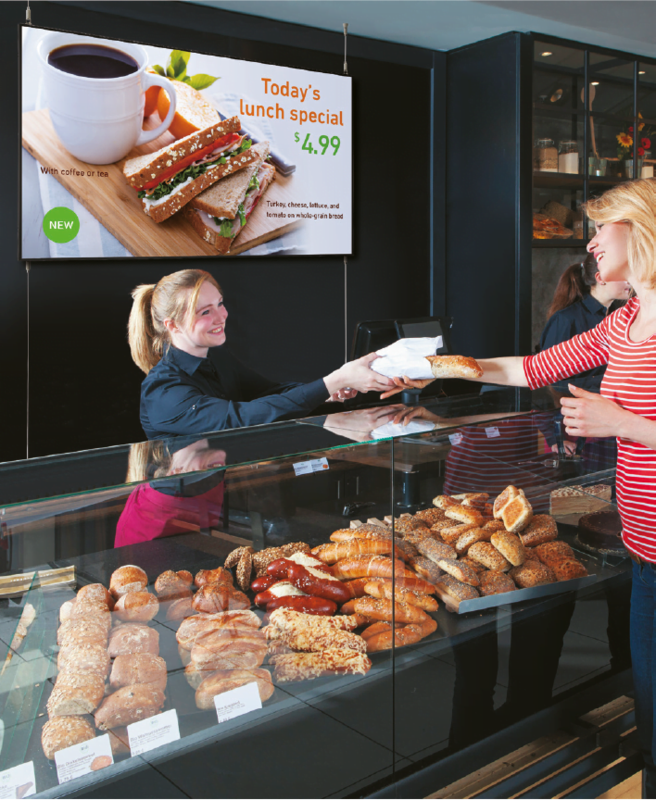 About to invest in new display screens for your business? Have you given any consideration to the best places to position these screens? The positioning is one of the most important aspects of any AV installation. For example, look at the London Underground, you never see any digital signage at ticket desks, instead they are positioned on platforms and escalators, where people are not distracted. The same consideration should be given to your business’ digital signage. At Midshire, we think there are 3 key places that digital signage works best in corporate offices: reception areas, canteens and toilets. While this may seem pretty obvious, many first impressions are made in the reception area. Receptions are often people’s first interaction with a company’s brand. Does your reception match up to your brand’s aspirations? 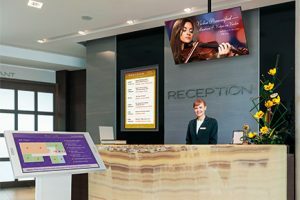 Rather than being a room with a receptionist’s desk and sofa whist you wait, your reception could become a warm, welcoming and engaging space, with the simple addition of display screens. You can showcase your achievements, such as recent case studies and CSR stories or share industry specific news. Some companies go to the next level and impress important guests with personalised welcome messages to make even more of an impact. Hosting a special event? Your display screens could tell people they’re in the right place and direct them to the right room. There are some important things to consider when positioning your new digital display screens in the reception area. Make sure that it’s at the right height, that it’s not too far away for people to be able to read the messaging, and also make sure it’s not facing a bright door or window, to avoid reflections. Does your workplace have a canteen, café or even a kitchen? If so, people will be queuing for their food or waiting for the microwave to come free, eating alone or waiting for colleagues to join the. This could be the ideal place to display the latest company news, share new company strategies or big business wins. Display screens don’t have to be mounted on walls. Why not install it horizontally, and making it part of the table? If your office welcomes lots of guests, chances are they will visit the toilets during their time at the office. A busy office tends to mean queues for toilets so it could be a great place to share messaging, or simply direct them back to their meeting space.